Goats were the first animals to be domesticated by early humans. They have been our source of milk, food, and shelter, and in some places, a goat is worth its weight in gold. These little animals were such an important part of the development of human civilization, that many myths, legends, and religions arose in their honor. According to Norse folklore, the thunder god Thor rode a chariot pulled by a herd of goats (rams in some sources) that regenerated each morning after Thor feasted on their flesh at nights. The Greek god of the Wilderness and Hunting, Pan, was a lustful half goat, half man (faun) who spent his days chasing nymphs. This may account for the animal's association with Fertility and Virility. Pan is only one of countless half goat hybrids in the Greek tradition. The Capricorn (for the Zodiac sign) and Satyrs are all elements of this culture. The Goat eventually became a regular feature in Masonic works. In the Christian tradition, the pagan god Baphomet became inextricably linked with Satan, the Occult, and all evildoers. The practice of associating Pagan gods with the Devil was often done in an effort to establish Christianity's dominance over the old religions. Ironically, in the Jewish tradition, goats are considered a prime animal for religious sacrifices and were reserved for honored guests. The term 'scapegoat' actually comes from a Babylonian tradition that was picked up by Jews during their time spent in the empire. Once a year, a goat was allowed to 'escape' from the village, symbolically carrying with it the sins of the villagers. Unlike their sheep counterparts, goats love to climb and mountain goats spend their days foraging at dizzying heights. In many cultures, this behavior is seen as a sign of Ambition and Advancement for those wanting to achieve more in life. These little animals are curious by nature and this natural curiosity is thought to breed a level of intelligence. They will nibble on any object within reach of their mouths and this has led to the mistaken belief that goats will eat anything, from paper bags to pieces of metal. Of course, it's doubtful that a tin can is a tasty meal. Skulls have long been connected to Death and Mankind's Mortality. A Goat Skull Tattoo is usually confused with the Ram Skull Tattoo and in some circles both are believed to be a way to mentally process your mortality. 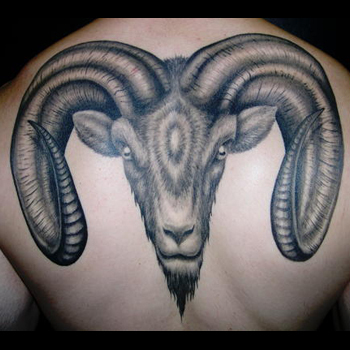 A ram is fearless in the face of danger, as such, a Goat Skull Tattoo symbolizes your fearless approach to Death. A Sea Goat Tattoo is really an image of the Zodiac sign Capricorn. Legend has it that the Greek god Pan jumped into the Nile river after fighting with the sea monster Typhon. The portions of Pan that were underwater turned into a fish tail, while his upper body, which was above the water level, remained as a goat. A Sea Goat Tattoo is usually worn by persons born under the sign of Capricorn. Billy Goat Tattoos are great ways to show off your playful side. After all, what's funnier than a goat that's up to some sort of mischief? These images hark back to your childhood days and their designs are usually conjured up when celebrating a good time with loved ones. There are many factors to consider when figuring out which tattoo design is right for you. The most important thing to remember is that your artwork should be meaningful to you, since your new ink can't be erased with a Mr. Clean Magic Eraser. If you need some inspiration, then our team is more than happy to help. Just visit our design page at www.itattoodesigns.com and take advantage of our Custom Service.